So I have this polish in my head. It's, you know, THE polish. 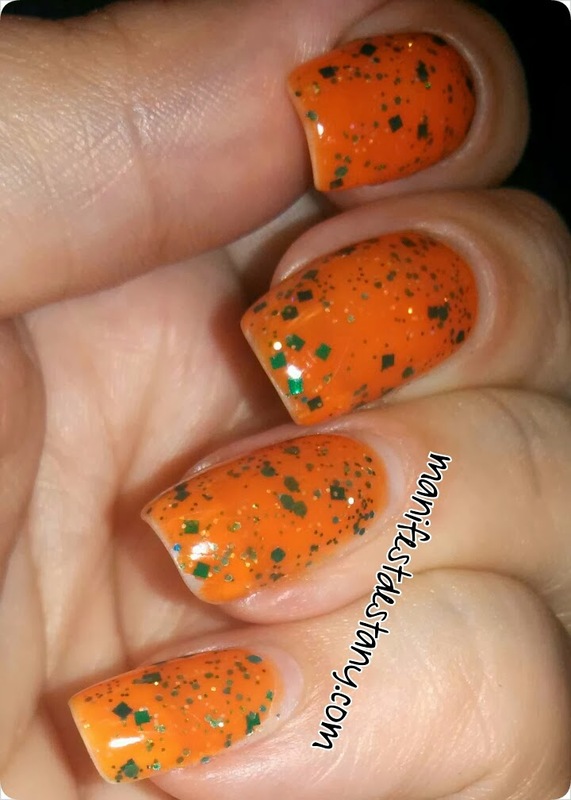 I came up with what would be my perfect polish...an orange jelly with teal glitter. Yes, that's my dream. I can't seem to find a polish like that, tho, so I decided to make it myself with a jelly sandwich! I started with two coats of Zoya Coraline, then added two different teal glitters - ORLY Mermaid Tale and Essence Edward. Then I topped with another coat of Coraline. ..and this is the end result! Unfortunately, this is a photo of my nails from my phone. As I've mentioned, I've been stuck in bed with Sciatica all week long. I painted my nails Saturday night, before all this happened. I've had the same nails since. 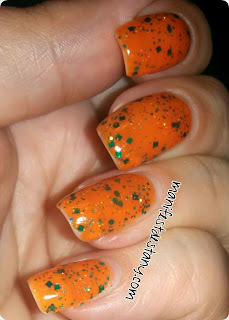 Which means, this is a photo of my nails at 6 days of wear, Only the one slight clip there on my ring finger. I think it's holding up very well! !